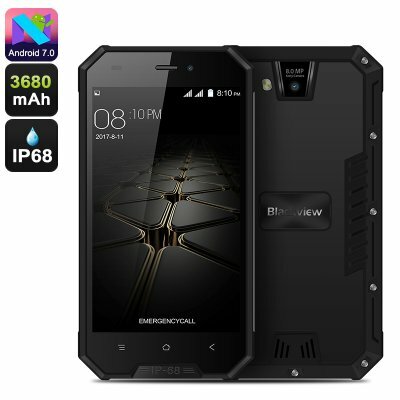 Successfully Added HK Warehouse Blackview BV4000 Pro Rugged Phone - Android 7.0, Quad-Core, HD Display, 3680mAh, IP68, Dual-IMEI (Black) to your Shopping Cart. The Blackview BV4000 Pro rugged phone is an Android phone that follows you anywhere you go. This tough smartphone features a durable IP68 body that makes it resistant to water, drops, and dust. Thanks to his, you’ll be able to use this rugged Android phone in literally any environment imaginable. If you spend much of your time in the outdoors or work in a rough environment, this rugged smartphone is perfect for you. Even its display has been equipped with extra tough Corning Gorilla Glass 3, meaning you won’t have to worry about scratching or breaking your screen while using it out in the wild. Within the waterproof body of this rugged phone, you’ll find a sophisticated Quad-Core processor that comes along with 2GB RAM. You’ll furthermore be treated to 16GB internal storage and a 32GB SD card slot. With this hardware in place, your Android phone allows you to tackle demanding media and applications without dropping a frame. You’ll be able to play games, enjoy apps, and watch movies on the phone’s 4.7-Inch HD display without ever slowing down your device. Along with an Android 7.0 operating system, a smooth user experience is guaranteed when using this Android phone. For ultimate connectivity, the Blackview BV4000 rugged phone comes with Dual-IMEI numbers. It furthermore supports both WiFi and 3G to keep you connected to the web at any time. A whopping 3680mAh battery brings along 18 hours of continuous usage time and an unbelievable 600 hour standby time. With this Android phone at your side, you can head out with confidence and you’ll never run out of juice again. While you’re out enjoying nature, the phone lets you shoot beautiful pictures and HD video with its 8MP Rear camera. The Blackview BV4000 Pro Android phone comes with a 12 months warranty, brought to you by the leader in electronic devices as well as wholesale rugged phones..